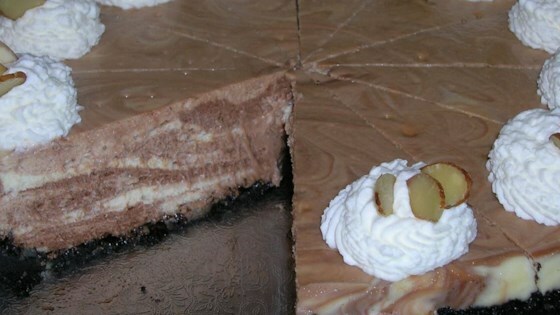 "Almond flavored cheesecake with bittersweet chocolate swirled through for a marbled effect." Preheat oven to 350 degrees F (175 degrees C). In a medium bowl, combine cookie crumbs, almonds, 1/4 cup sugar and melted butter. Mix well. Press into the bottom and halfway up the sides of a 10 inch springform pan. In the top of a double boiler, heat chocolate, stirring occasionally, until chocolate is melted and smooth. Remove from heat and allow to cool to lukewarm. In a large bowl, beat the cream cheese and 1 cup sugar until smooth. Beat in the eggs one at a time. Fold in the almond extract and sour cream. Pour 1 1/2 cups of the filling into a smaller bowl. Stir the melted chocolate into the smaller bowl, then fold loosely back into plain filling. Pour into crust. With the tip of a knife, swirl the filling to create a marbled effect. Bake in the preheated oven for 40 minutes. Turn off oven and let cake cool in oven for 1 hour, with the door closed. Cool at room temperature, then refrigerate overnight. WONDERFUL RECIPE. I FIXED THIS WHEN WE HAD COMPANY, AND THEY ALL LOVED IT. IT IS BETTER AFTER IT SETS A DAY. THE ALMOND EXTRACT CALLED FOR IS JUST RIGHT.